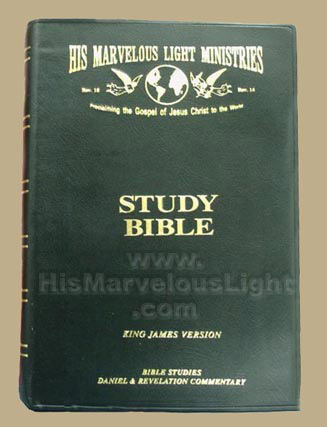 By God's grace, His Marvelous Light Ministries was able to raise the funds to publish a very special King James version Bible. What's so special about this Bible, you ask? Read on! 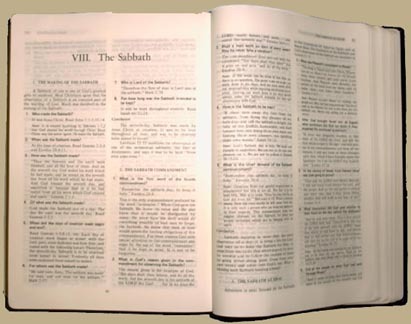 This complete KJV Bible, Old Testament and New Testament, contains invaluable study helps. In the back you will find an outline of 85 Scripture topics, providing Bible answers to more than 600 questions most frequently asked by serious Bible students. You will find these studies superb for giving Bible studies! 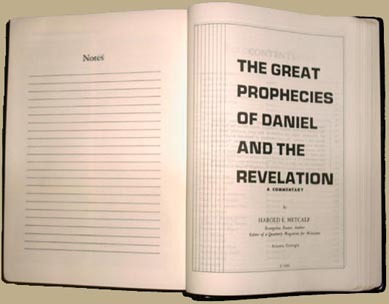 And not only does this Bible have the 85 Scripture topics, but it has a second study section with a verse-by-verse study involving a full message presentation of truth in the setting of the great prophecies of Daniel and Revelation! That's right - a VERSE-BY-VERSE study of Daniel and Revelation! This special HMLM-edition GIANT PRINT KJV Study Bible also has wide margins for writing texts and notes as well! The words of Christ are in red. The cover is a durable vinyl, with gold imprinting and gold leaf edging. The printing size (font) is approximately 13 point. Click here to see a sample page! $25.95 and this INCLUDES shipping! We DO offer a discount for case lot purchases (16 Bibles per case) - Save $63.20 - only $352.00 per case, which INCLUDES shipping! Call or e-mail us and place your order today! or pay for your order online right now via PAYPAL!